For the latest news, please see the team's own website. Interested in dancing? We will be holding trials for the Blues squad on Sunday the 12th of October 2014 in the gym at Parkside Federation Academy. No prior experience or partner is necessary. Prior Dancesport experience is not specifically required, and we have had dancers from a variety of backgrounds, including ballet and hip hop, make the transition into dancesport and be selected for the team right from the start. We are after individuals with a desire to learn and train hard, and who love to dance. If, however, you do have competition experience then please, of course, do turn up as well. The trials are split into two sessions. The afternoon session is for those with competition experience in Dancesport. Whether that experience is medallist, university, open, closed, or international, we would love you to come. 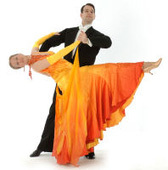 If you have absolutely no experience of dance, our beginners team is the place for you. This team has unlimited capacity and again can be joined without a partner, or even knowing a samba from a slow foxtrot. The only criteria is that you cannot have had a professional Dancesport lesson before March 2014. As of the 21st February 2013, and thanks to the hard work of the outgoing Captain and Vice-Captain, Dafni Metaxa and Sophie Robertson, Dancesport is now recognised as a Full Blue sport for women. Their work, along with the efforts of the coaches and team members over the years, stands as recognition of the intense training, effort and discipline required of Dancesport. We have been one of the most successful Blues teams within the University over the last few years, and it is this hard work and dedication from our team that has brought us to where we are today.